The Angel of Whispers and an angel she was, truly. Think of a spirit that actually listens!! Not the kinds likened in Hollywood slasher flicks, but one who’s docile, caring and has the required patience. All you have to do is “Whisper” in her ear and stroke her back, as if gently demanding something from your parents. Visiting Mya Nan Nwe at Botahtaung Pagoda is amongst the closest one can get to a transcendent spiritual experience in Yangon or even in Myanmar, simply because it’s real. The benevolent soul born to a royal lineage spent her life uplifting the less fortunate. Her involvement in rebuilding the Botahtaung Pagoda after being damaged in WWII created a following in worshippers and admirers alike. 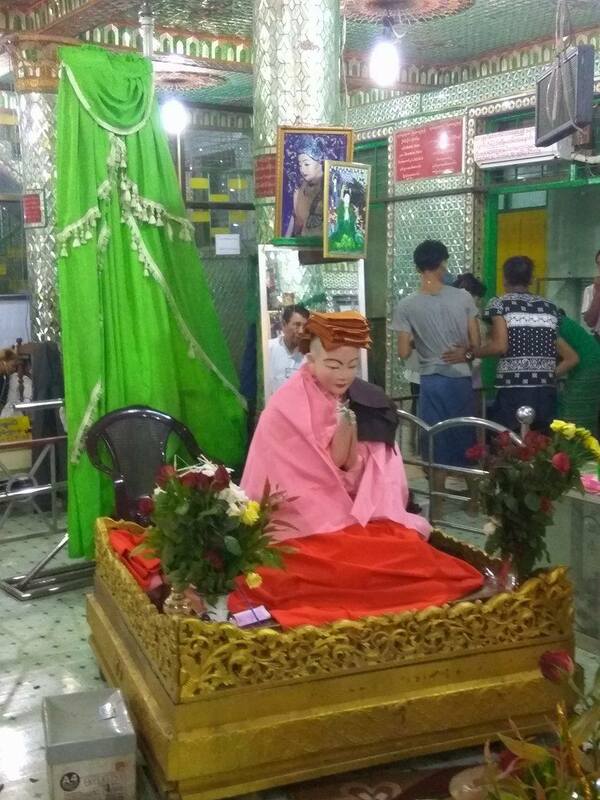 The Botahtaung Pagoda is one of the famous pagoda that is believed to hold Buddha’s hair relic, which probably was also the reason for unwavering devotion of this particular spirit or "Nat" as known locally. The relic is enshrined in a maze-like interior within a golden walled Stupa. What makes it unique is, Stupas are traditionally blocked from entering but this one isn’t. Another interesting fact is, the Brass statue of Buddha was taken away during the British occupation and returned after independence. Has a rich history this pagoda, being built around the same time as Shwe Dagon around 2500 Years ago. 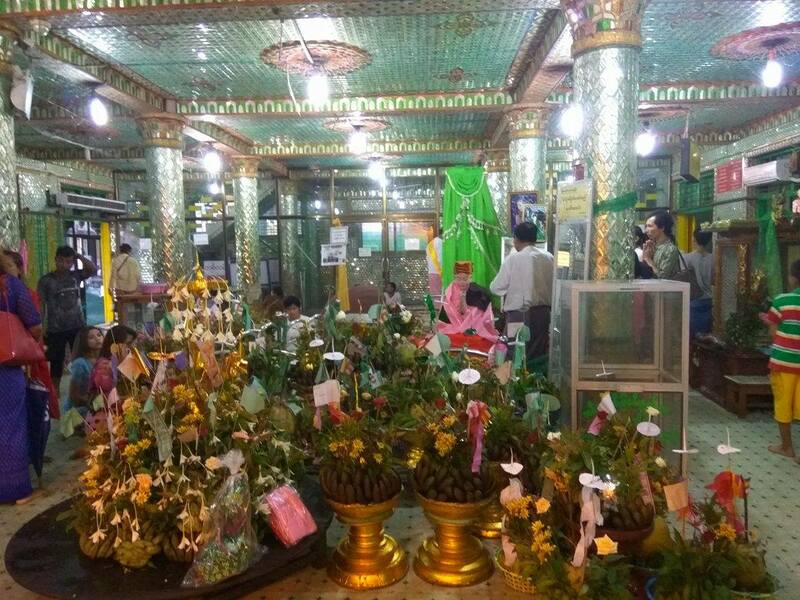 As a mark of respect, Mya Nan Nwe’s legacy was enshrined as a Nat in Botahtaung Pagoda. While a Pagoda is for the Supreme Being, the Nat is for the Supreme Spirit. And the Supreme Spirit was listening (have to cup hands at her ear and make sure you’re not being eavesdropped! Also one at a time please she does not like being ambushed), solving problems and granting occasional wishes. For starters it is filled with relics from around Burma. 1. The entry has a relic as you walk in and look up. This is the cover that was found over the other relics in the pagoda. 2. Walk through the Pagoda and find the window that has only clay pottery and tablets. This is what was over the Buddha hair relic. There is another little clay pagoda shaped relic that held the little gold container with the hair relic. The best time to visit is afternoon on weekdays as there will be not much devotees in the noon. Enjoy your time at the pagoda and take your time walking around seeing all the old statues. The popularity is increasing as Mya Na Nwe grants as many wishes as possible (as mentioned by some devout devotees from Thailand) and we are creatures of wants and desires. Situated a Stone’s throw away from Botahtaung Jetty, it is easily amongst the famous landmarks of Yangon. A Taxi ride from any of the popular areas should get you there inside of 3,000 Kyats. Entrance fee is applicable for Foreigners.